Years ago, a Deep Green Resistance member hosted the RAGE podcast: Radio Against Global Ecocide. We have posted an archive page of the audio episodes, and we wanted to repost this episode from August 12, 2010. 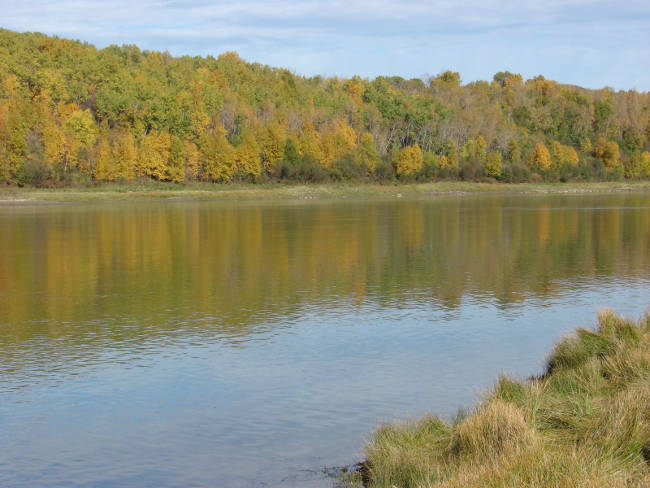 Host Seymour Lyphe holds his first interview with a non-human: the kisiskāciwani-sīpiy (Saskatchewan River) near his home. I used to believe I was fairly good at being in touch with nature. When I walked though the forest I would walk around spider webs, careful not to step on mushrooms. Even in town I would step over ants on the sidewalk, which is tricky because ants are not very linear. I talk with chickadees, crows, and magpies; any bird that will hang around for a chat. I stop walking so a squirrel will not see me and can safely cross the road. I talk with plants and, yes, have even hugged a few trees, which gives a very calming feeling. It was not until I did the interview with kisiskāciwani-sīpiy that I realized that much of my relationship the real world was, well, less than real. My connection with the kisiskāciwani-sīpiy was one of the most emotional experiences of my life. It has been very hard for me to figure out how I going to present this; at the same time I believe it is important that I do. As I was sat down (I slipped and fell in a sitting position so I stayed where I was) to do my interview with the river and record the sound it was making, it become obvious, as it would to anyone who sits by a river, that a river is much more then water running over rocks. It is everyone who lives in and around it. It is the beings who come in contact with it, no matter how briefly. I will play Derrick Jensen’s piece “Pretend you are a River” at the end of this, as it is one of the best pieces I have every read and heard on what it is to be a river. Here is the story the river told me, through imagery and emotion. The kisiskāciwani-sīpiy was born with the rise of the mountains and was shaped through the ice age. Now it told me it is dying. The glaciers that give it life are fading away. I was shown images of a time when the forest and prairie crowded against the river, when it had friends to talk with, not the strange yellow or green aliens of today. Imagine you are being poisoned. Imagine that the life blood is being drained from you so the poison becomes stronger. Imagine that you are forced to pass this poison on to all your friends and those who live with you. Imagine you are forced to give this poison to everyone you meet on your path. Imagine that with very fibre of your soul you do not want do to this. You scream out for help but those who listen are gone. And the poison keeps coming. I saw the death of kisiskāciwani-sīpiy friends, death of those who listened. At times there was more blood then water, then the oldest of friends fell and soon came the strange and crazy ones. During this time I cried as the river was crying. It seemed to be coming from a depth I have not been to before. I choked and gasped as if I were trying to rid myself of the poisons within me. At times I just writhed in pain. Afterwards I lay there, stunned by the emotions I had witnessed. I felt I had just an inkling of what it must be like to be tortured or subjected to the worst concentration camp conditions. I thought also that we who live in the dominant culture really have no idea what it’s doing to the world, to the living earth, for our comfort and ease of life. I’d like to think that if those who are supposedly fighting for kisiskāciwani-sīpiy and other rivers really understood the pain the rivers are in, they would be working that much harder to protect them. But I am not sure, for I have seen very little willingness on the part of environmentalists to give up their comfort for any of the living world. I also start to understand what it is to be alive in the world, to feel connected to the place I live. I wonder if I came anywhere close to the connection between past listeners and the river. I will make every effort to do so. After my talk with kisiskāciwani-sīpiy I have come to realize that we are meant to drink living water. The water that comes from pipes is no longer living, and is full of its own unknown concoctions. The problem is that the living water is now poison and we cannot drink it. Tap water is zombie water, zombie water for zombies. We need desperately to heal the rivers, heal ourselves. We need a resistance that will make it so. “Deja nuestra tierra o morir en ella!” Este es el mensaje del Movimiento para la Emancipación del Delta del Níger (MEND) para la industria del petróleo. La historia, las acciones y tácticas del MEND son el foco del libro publicado por el Observatorio Petrolero Sur (OPSur) titulado, “Delta es Revuelta. Piratería y de guerrillas contra las Multinacionales del Petróleo”. Podría decirse que MEND es uno de los movimientos de resistencia más eficaces contra la industria del petróleo—el MEND es responsable de un recorte de casi un tercio de la producción de petróleo de Nigeria entre 2006 y 2009. Esos son números que el movimiento ambiental contemporánea sólo puede soñar. Como organización sobre el suelo, Deep Green Resistance utiliza la acción directa para privar a los ricos de su capacidad para robar a los pobres y los poderosos de su capacidad para destruir el planeta. También argumentamos a favor de la necesidad de un moviemento clandestino que puede apuntar a la infraestructura estratégica de la industrialización, al igual que el MEND está haciendo en el delta del Níger. MEND ofrece un ejemplo de cómo estratégica, la resistencia específica puede confrontar a los que están matando a nuestro planeta. Aprende sus maneras, apoya su causa, y toma acción! “En Nigeria, todas las esperanzas en la democracia y en el bienestar suscitadas por la independencia y el descubrimiento de petróleo, naufragaron en los pantanos del Delta del río Níger, hundidas por la explotación salvaje de multinacionales como Shell, Agip y Chevron, y por la corrupción de los gobiernos locales. A la sombra de un cielo contaminado y de un mar sin peces, un joven del lugar afirma, la gente ha empezó a pensar: «Tenemos que armarnos si no queremos morir ». La violencia engendra violencia. Y cuando una persona pierde la esperanza, se siente destrozada y acaba diciendo: «O combato o más vale morir». Así, sobre rápidas lanchas, con pasamontañas, fusiles automáticos y kalashnikov, los rebeldes del Delta pasaron al contraataque, saboteando a la industria del petróleo. Son la voz armada de una población entera, agotada por decenios de saqueo de recursos y por la represión militar que intenta truncar sus protestas con todos los medios disponibles. Luchan por el fin de la contaminación de sus tierras, para la indemnización por los daños sufridos y para la restitución del control de los recursos a las comunidades locales. Deep Green Resistance New York member Frank Coughlin is part of Woodbine, a group of revolutionary minded folks in Queens working on the questions of autonomy in NYC. Just before New Year’s 2016, they released “A Resolution”, one in a series of videos aiming to change the mythology around the need for struggle. To disrupt and dismantle industrial civilization; to thereby remove the ability of the powerful to exploit the marginalized and destroy the planet. To defend and rebuild just, sustainable, and autonomous human communities, and, as part of that, to assist in the recovery of the land. If we respect ourselves ― if we respect the world ― it is time to get organized. It’s not just going to be alright. And it isn’t just – “Hey what are you going to do?” It is urgent that a new, historical force rise up: now. “A Resolution” is a powerful call to organized action. We hope you’ll take heed, joining DGR or another group to make the changes we all need.